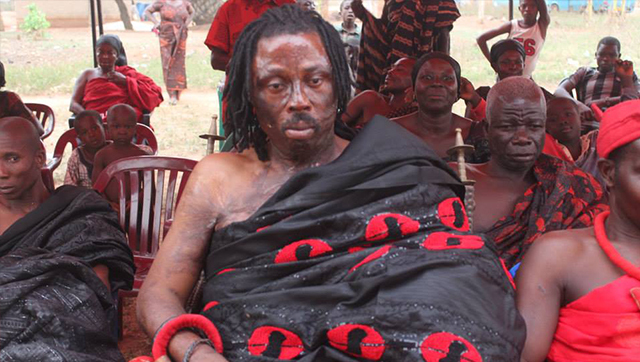 Popular witch doctor and fetish priest, Kwaku Bonsam led a delegation of two other traditionalists to the Supreme Court this morning demanding Ghana’s Government to build a National Shrine. According to Kwaku Bonsam, the Ghana Association of Fetish Priests is a baby organisation that needs a headquarters for their meetings and other activities. Together with Dzakpatavli, a fetish priest from the Volta Region (the General Secretary of the Association) and Nana Aprukusu from the Eastern Region (National Organizer of the Association) Kweku Bonsam, in a petition said that it is in the best interest of government to build the National Shrine or face the consequence of discrimination, borne out of the government’s intention to build a national cathedral for Christians. They added that the Government can later consider adding a shrine per district to be added to the implementation of the one-district-one-factory policy.